LANTERN CITY signing with Trevor Crafts, Matthew Daley, Bruce Boxleitner and Mairghread Scott! It's Steampunk Saturday at The Comic Bug as the creators of BOOM! 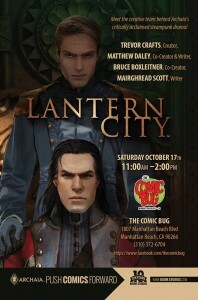 STUDIOS LANTERN CITY come and sign copies of this critically acclaimed sci-fi adventure! From the writings of Jules Verne and H.G. Wells, to comics like The League of Extraordinary Gentlemen and Lady Mechanika, the detailed and imagination-fueled steampunk movement has excited fans worldwide. Set in an original, sprawling steampunk world, Lantern City explores everything we love about the genre and what it takes to change a person's place in the world. Sander Jorve just wants to keep his wife and son safe. Living in the brutalized lower class of Lantern City means living in near constant darkness, the enormous walls of the city always looming overhead, while the upper class enjoys the elevated, interconnected towers and airships above. When Sander's brother-in-law, the persuasive activist Kendal, convinces him to infiltrate the brutal ranks of the Guard, he's set on a dangerous path that will test his abilities and beliefs, all in the name of making a difference for his family and his caste. Come check out this beautifully illustrated steampunk sensation! We'll leave a lantern on for you!